Mare Nostrum News: When was the Trojan War? We know about the Trojan War from Homer, the poet who composed both the Iliad and the Odyssey. The Iliad is set during the Trojan War, the ten-year siege of the city of Troy by a coalition of Greek kingdoms. The Odyssey is the story of Odysseus, king of Ithaca, whose journey home takes ten years (after the ten-year Trojan War). Scholars continue to debate questions such as whether the Trojan War actually took place and they always ask the same questions: where did it take place and when did it take place. The first question was answered by Heinrich Schliemann (1822-1890), who began digging in 1870 (not excavating) at Hisarlik, an artificial hill in western Turkey, now situated approximately 6.5 kilometres from the Aegean Sea and about the same distance from the Dardanelles. He found several layers of occupation and declared he had found Troj (Τροία). Historians now agree that Hisarlik is indeed the fabled city of Troj. The actual date of the Trojan War remained elusive, but Greek astronomer Stavros Papamarinopoulos and his collegues have found a very credible solution. They looked closely at the astronomical and biological information that Homer included in the Odyssey. Five days before Odysseus' finally was able to return to Ithaca, Homer wrote: '... and the sun has perished out of heaven and an evil mist covers all.' 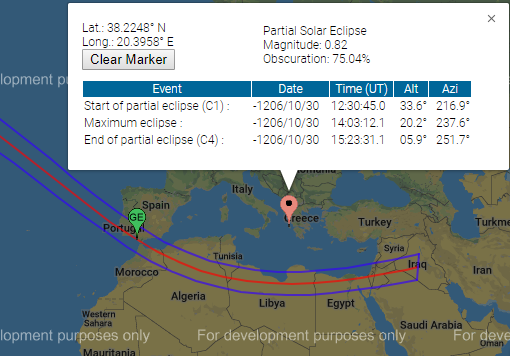 Papamarinopoulos thinks that this must signify a solar eclipse, but there are several possible eclipses that fit within the historical time frame. Even Plutarch and Heraclitus believed that the passage in the Odyssey (“Theoclymenus' prophecy”) to be a poetic description of a near total solar eclipse. Baikouzis and Magnasco write that 'close to noon ….the total eclipse of the sun occurred at 12.02 p.m local time'. Homer also gives signiﬁcant details in connection with the climate, the environment, the plants, the animals and the peoples' habits, which strongly prove the autumn as the season of the Odysseus’s return to Ithaca. In conclusion, the only possible date for Odysseus’s return to Ithaca is 30 October 1207 BC plus five days. Which means that he finally returned home on 4 November 1217 BC. Given that it has taken Odysseus ten years to return home, the ten year Trojan War must have raged from 1227 BC until 1217 BC. Part 2 of this series 'When was the end of the Trojan War' can be read here. Papamarinopoulos et al: A New Astronomical Dating of Odysseus' Return to Ithica in Mediterranean Arhaeology and Archaeometry - 2012. see here. Baikouzis and Magnasco: Is an eclipse described in the Odyssey? in PNAS - 2008. See here.